We're currently very taken with the OnePlus 6, but OnePlus has been making powerful, affordable phones for four years now, and it's sometimes easy to forget everything that happened before the latest flagship device turned up. We're here to refresh your memory. We'll start right back at the beginning with the 2014 OnePlus One handset and explain how the specs and the style of these phones have evolved (or not) down the years. There's no doubt it's been a very rapid – and a very impressive – ascent from the Chinese outfit. There was plenty of hype around the 2014 launch of the OnePlus One, which promised high-end specs at a mid-range price from a cool new startup. On the whole it delivered, starting at just £230/$250 – around half the cost of the top-end handsets of the time. For that you got a phone with a 5.46-inch, 1920 x 1080 pixel screen, a 13MP rear camera, a Snapdragon 801 processor and 3GB of RAM, which was excellent in 2014. Perhaps the only downside was that restricted invite system, but we happily gave it four stars out of five. The OnePlus 2 took the success of its predecessor and built on it, with a stylishly updated design and more power (a Snapdragon 810 and up to 4GB of RAM this time). Again though, it was that low, low starting price that really stood out: £240 in the UK or $330 in the US. OnePlus, it appeared, had done it again – and demand was accordingly through the roof (the first 30,000 units sold in 64 seconds). The OnePlus 2 arrived in 2015, but the 2014 iPhone 6 would have originally set you back £540/$650 or above, and that's quite a gap. The OnePlus 2 was revealed in July 2015, but it was quickly followed by the OnePlus X in October 2015. This was the first budget (£200/$250) OnePlus phone, and the first that didn't really take off – that's perhaps why the company hasn't made a budget phone since. The 5-inch phone had a rather modest specs combination of a Snapdragon 801 and 3GB of RAM (like the previous year's OnePlus One), and despite some design tweaks we were left underwhelmed, advising readers to pay the extra cash and pick up the OnePlus 2 instead. OnePlus was back in June 2016 with the OnePlus 3, offering a 5.5-inch, 1920 x 1080 pixel display, a Snapdragon 820 CPU, 6GB of RAM, and a 16MP rear camera, amongst some other impressive specs – after the disappointment of the OnePlus X, this was a return to form. What's more, it had a brand new aluminium unibody design, so it looked the part too, and came with the new OnePlus "Dash Charge" quick-charging technology. Considering you could get all this for a starting price of £330/$400, it's no wonder it left consumers wowed. This was when OnePlus started the "T" tradition – offering a second flagship with minor upgrades later in the year. In November 2016 we saw the OnePlus 3T, bringing with it a slight performance upgrade and a substantial battery boost over the preceding phone. The design and screen was just the same as the OnePlus 3, but that was fine in our book. The price did jump a little, with the improved OnePlus 3T starting at £400/$440, but OnePlus was also getting better at making its phones more available outside of China. And so to the OnePlus 5, which was carrying a Snapdragon 835 and up to 8GB of RAM, but otherwise kept the same 5.5-inch, 1920 x 1080 pixel display and 16MP rear camera. It didn't follow the trend of banishing the bezels, but was still a sleek, very fine-looking phone. A dual-lens 16MP+20MP rear-facing camera was around the back, the first time OnePlus had opted for a two-cam setup, although the camera remained something of a weak link. Arriving in June 2017, the OnePlus 5 first went on sale for a starting price of £450/$480. The OnePlus 5 was just five months old when the OnePlus 5T arrived in November 2017. The phone had an improved camera and a bigger, longer, 6.01-inch screen with smaller bezels – though with a resolution of 2160 x 1080 pixels, that 1080p limit still remained. With those tweaks and essentially the same powerful guts as its predecessor, the OnePlus 5T was easily one of our favourite phones of the year. Thankfully, the phone's starting price stayed more or less the same as well, coming in at £450 in the UK and $500 in the US. Now we're right up to date with the £470/$530 OnePlus 6 – it carries a Snapdragon 845 and up to 8GB of RAM, and can score some seriously high scores in benchmark tests. We also have a 6.28-inch, 2280 x 1080 pixel display, and a 16MP+20MP rear-facing camera on board. Despite some niggles – still that 1080p resolution, no wireless charging, no waterproofing – the OnePlus 6 is a serious bit of kit. 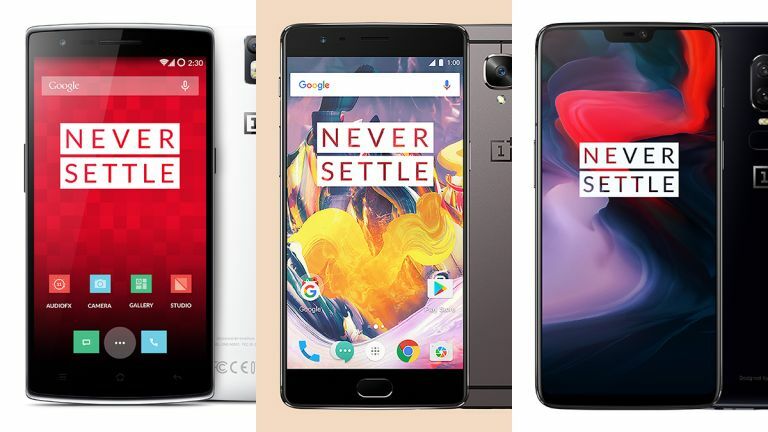 You can clearly see the evolution of the OnePlus phones since 2014, and we're looking forward to finding out what's coming next.